Watching Videos on the Web has become a trend after Broadband came into existence. It might be anything – Movies, T.V Shows, Sporting Event, a mini video clip and what not. Viewing videos on the web has increased drastically over the past few years but buffering is one major problem that many of you wouldn’t have surpassed even till now. Reason being simple: Buffering issues is a very annoying problem that is faced by majority of the Internet popution as they have to wait in order to watch a video and every individual is pestered by it. HD videos gets stuck even when you have a 100mb connection. So how to go about it? 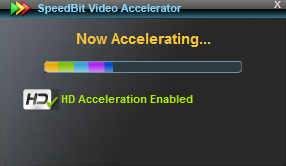 The best solution to tackle buffering issues is SPEEDbit Video Accelerator. It is the perfect tool that makes video streaming faster and moother by reducing buffering problems. It helps in downloading video from multiple sources simultaneously and thus enables the video to play smoothly and better. SPEEDbit Video Accelerator is extremely easy to use as it has got a user friendly interface and no complicated settings whatsoever and just needs to be started in order to perform its task. The best part is that it automatically detects when a video is being played and it starts its job instantly and allows you to have a smoother playback. It has got the feature of proxy settings using which you can obtain greater dedicated speeds while viewing vidoes. You can even hide the “Now Accelerating” Message if you find it annoying. Watch smooth HD videos with Premium acceleration. The video formats that it supports are given in the screenshot below. 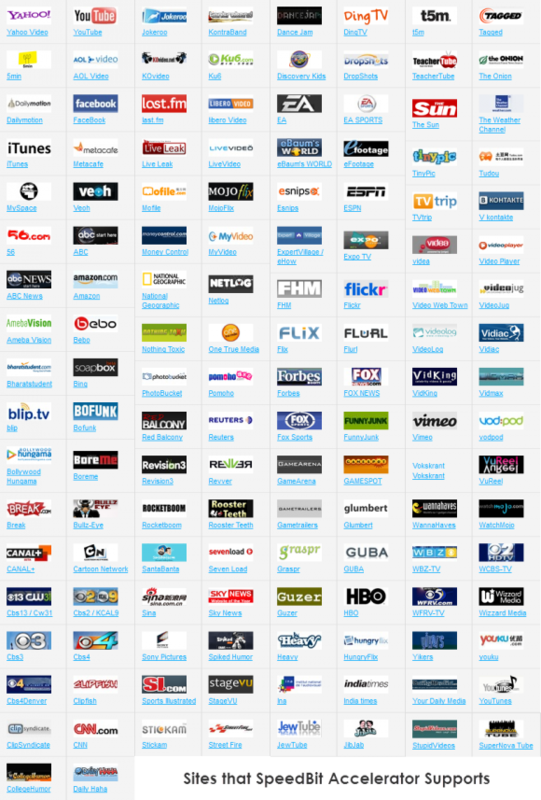 It is available in 14 languages and supports over 165 Major Video sites. Here is the list. Setting up the software is quite simple. Just download the file and install it. Once finished, It will run in the background whenever a video is being played and accelerates the video transfer. Share This Post On your Facebook Profile Page and other Social Networking Platforms and post the links through the comments as a proof. Winners will be selected randomly and would receive the licenses through their e-mails on 5th June which is the deadline for this Giveaway. Good Luck. Also watch out for the cool giveaways in the near future. Sorry forgot to add links . Really thanks for the give away , it is a nice way to show your site and how dedicated you are to provide not only information , but the best tools for Internet :)) I already use the free version of Speedbit and its really great ! Not everyone does that , unless they care. thanks again , and good luck !! I would like to know if you have shared the posts. If yes, do send us the links to those posts. wow! I would really love to be a winner of the giveaway because I’m yet to see a video accelerator of its class. It’s just awesome. I like to win because I really like to have the HD video acceleration. Thank for this giveaway! I would love to have copy for myself because my internet speed is so slow. To steam a 5 minute video wpuld normally takes me approximately 20 minute or so and with Speedbit Video Accelerator really does help me improve my streaming speed a lot. Currently I am using it beta free version and it would be awesome could try out it premium feature that allow to us to accelerate HD video. Thanks for the giveaway. I’m preparing for GMAT and couple of resources are available as video. Hence this would help me a lot in accelerating those videos as I’m on less than 512kbps plan. You are eligible to participate only if you share this post on your facebook and twitter wall and post the links. Please read the article completely. I have specified the conditions in the end. Thanks for this Giveaway.Please count me in.I love speed bit video accelerator.I am used to watching video on internet and speed bit video accelearator will help me in watching any video without buffering.I want this soft.Hope i win. Please count me in for this! I am always watching music videos on Youtube etc. I hate waiting for them to buffer and I like to skip through some stuff. When skipping I always have to wait for it to buffer and catch up. I would like to give this a try to see if it helps. I am using a DSL connection so I think this could really come in handy. Thank you for the giveaway! I have shared on FB and liked. I would like to win a license of this gem because I live in a rural area where high speed connection is just a mirage. So SPEEDbit Video Accelerator could actually leverage my video buffering experience on the web dramatically. Thanks a lot Dude for this Giveaway! Please do me a count too.. I love to get this software because I watch a lot of videos from the Youtube & face buffering problem.This software will definitely solve this problem.Thanks for this giveaway. I have a 100Mbps connection, and often have stability problems with high-resolution stream. Thanks for the contest.